90% of drains lead directly to a type of body of water and it is vital for us to protect these water ways and the environment. Any emergency response plan should include a seal protector for storm drains as part of a spill response kit. 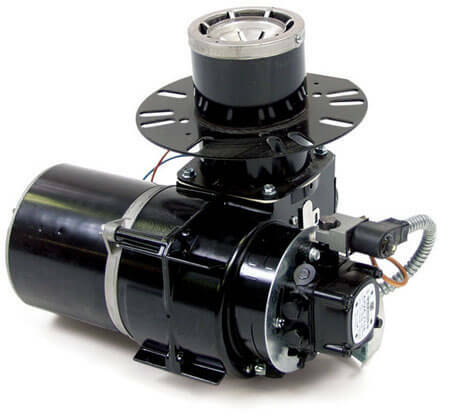 Ultimate Washer provides spill responses products, such as drain cover seals, spill containment berms, and catch basin filters that not only protect but can prevent costly cleanup later, a viable tool in storm water pollution prevention. 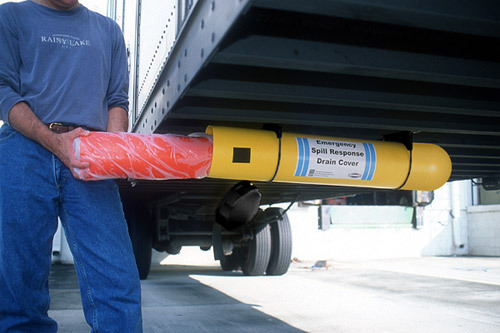 "Practical Spill Response to Emergency Situations"
The emergency seal is constructed from polyurethane with a reinforced mesh center creating a strong and durable product that will last for years. A unique property of poly urethane is its ability to bond to smooth surfaces creating a temporary seal that prevents contaminants from entering into drainage systems.Polyurethane is also a non-absorbent material that is resistant to water, oil, and most aggressive chemicals. Sewer seal covers help meet SPCC , NPDES, BMP, and EPA guideline standards. Optional: Wall Mount and Truck Mount receptacles are an easy way to store your seal and provide quick and easy access in any spill response. Due to breakdown caused by UV rays and heat we suggest using a storm cover with PVC top layer if using drain grate cover longer than 2 hours. We do not recommend using a pressure washer on the soft polyurethane material. Regular inspection of the material is suggested to ensure the material is usable in case of an emergency. 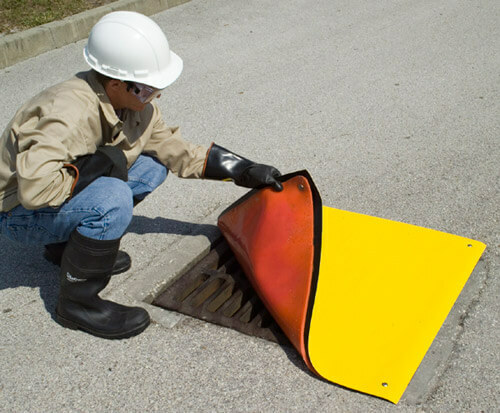 If you are looking for a rugged, long-term spill response solution, look to a PVC topped grate cover. These seals have the same polyurethane technology as the regular drain storm seal but are reinforced with a top layer of yellow PVC. Optional: Wall Mount and Truck Mount receptacles are an easy way to store your drain seal plus and provide quick and easy access in any spill response. 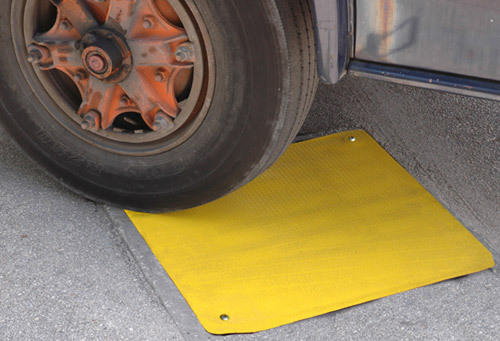 Due to the limited surface area of some metal storm grates and drains, storm cover with PVC top can be damaged if driven over. Please call for more information. An easy and viable source to store your drain seal is to use an easy accessible wall mount or truck mount receptacle. Not only do the Velcro straps allow easy access, but it also allows everyone at the job site to know exactly where the storm drain is located in case of an emergency spill. Wall and truck mount capsules are made of high density polyethylene that are non-corrosive and guaranteed not to rust. Wall mount containers are easy to install and come with all needed hardware. Vacu-Boom can easily capture and remove chemicals and fluid waste from the site. Try one of these for temporary containment of hazardous or contaminated liquids. Guidelines on proper outdoor cleaning and wash water disposal. Learn about EPA laws and the best way to obey them.